Advertising sign for 'King George IV' whisky. 1965. Chemicals and Plastics Group. Carbon Dioxide Division. 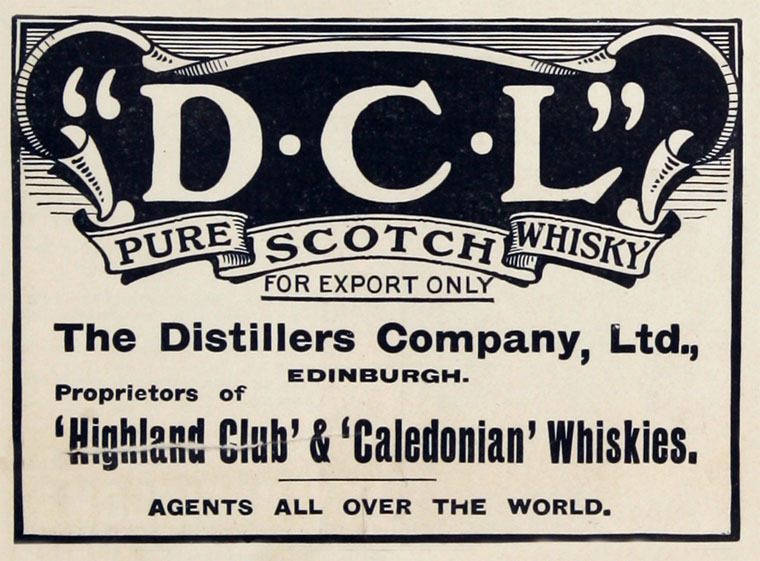 1877 The Distillers Company Limited was a public company formed by a combination of six Scotch whisky distilleries. c.1885 Began a policy of diversification to spread risks of failure in any one part of the business. 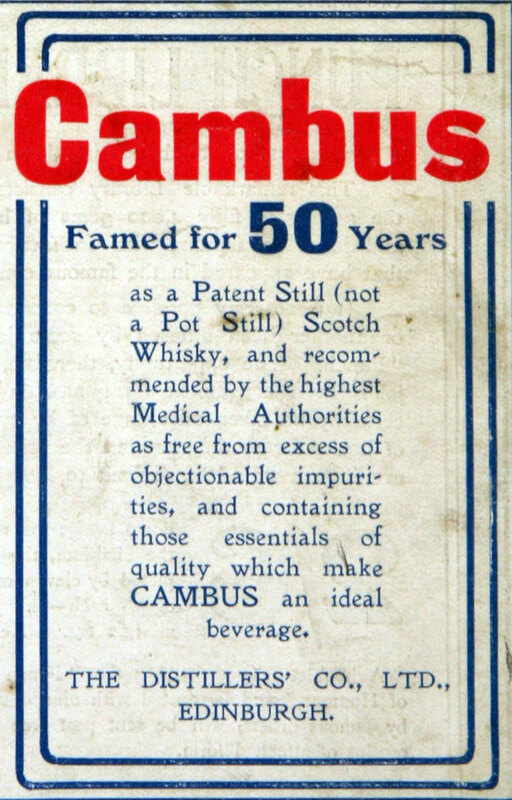 1910 Controlled 10 distilleries in Scotland, five in Ireland and one in Liverpool. 1915 The yeast business was sending weekly supplies to the forces in France. Industrial alcohol was in great demand for the manufacture of explosives; this was important to the company even though the price was not as good as for potable spirit; the directors were alive to the potential for using alcohol for making other products. 1922 Production of "Discol", motor fuel made from alcohol which although expensive might help to alleviate shortage of petrol. 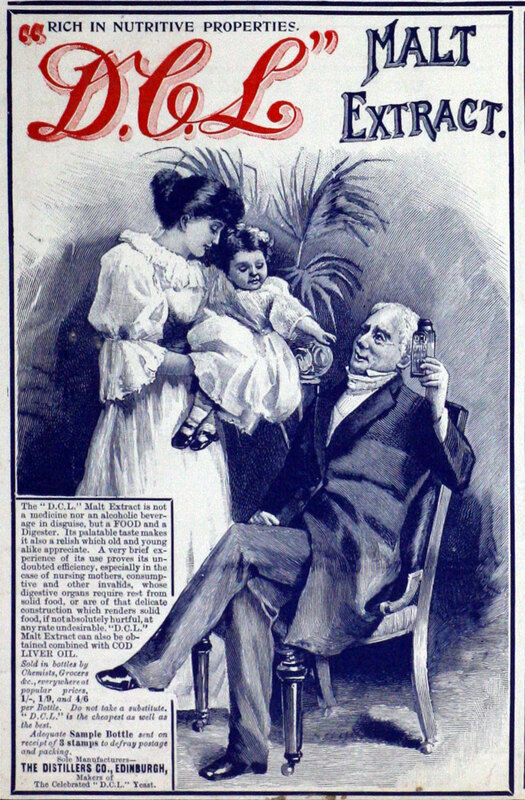 1922 Acquired the gin business of Tanqueray, Gordon and Co.
1924 In order to find a cheaper feedstock than molasses for making Discol, the company acquired 2 "Continental" processes that were amalgamated in a new company International Sugar and Alcohol Co, in which Distillers had the controlling vote. 1928 Turner and Newall and Distillers Co jointly formed the Carbon Dioxide Co Ltd to handle sales of the gas produced by some of their works. 1930 Arrangement with United Molasses Co for exchange of shares. 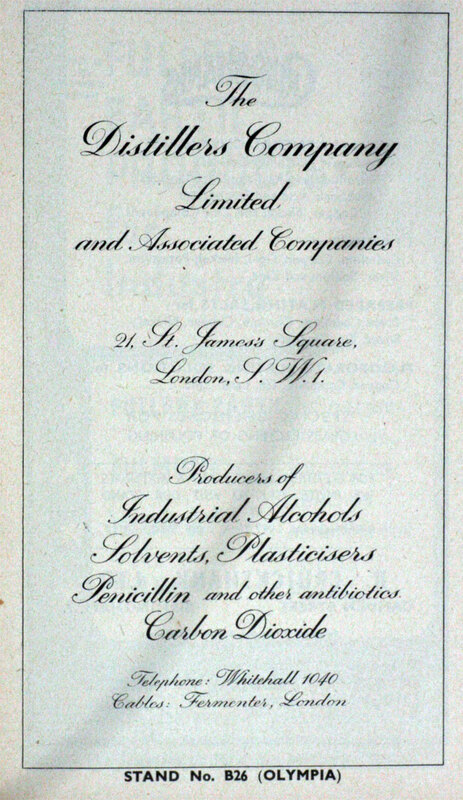 Formation of British Industrial Solvents Ltd to make acids and other solvents from industrial alcohol. 1933 Gyproc Products Ltd, controlled by Distillers Co, was formed at Rochester and subsequently at Glasgow. 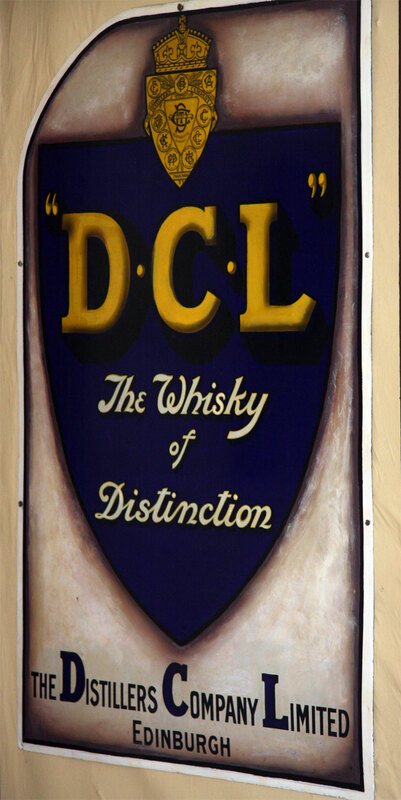 1934 Distillers Co gave Cleveland Petroleum Products Co the rights to use the trademark Discol in exchange for an undertaking to buy the alcohol needed from Distillers. 1936 Advert: Cleveland Discol fuel. 1937 Acquired Booths Distilleries Ltd.
1937 The Distillers Co purchased a small company, British Resin Products Ltd (BRP), manufacturers of paint and other thermosetting resins in Tonbridge, Kent. 1937 United Glass Bottle Manufacturers acquired four bottle manufacturers from the Distillers Co.
1937 With Crosse and Blackwell, the Distillers Co held a controlling interest in the British Vinegar Co.
1937 AGM told that the company recognised that may be necessary to explore 2 or 3 new lines of business arising from chemical developments in the laboratory in order to find a successful extension to the business. Extension of Gyproc business in Scotland, and Carbonic Acid (dry ice) business at Bankhall and Hammersmith. 1939 Acquired majority holding in Commercial Solvents Ltd of Bromborough, Cheshire, which made industrial alcohol and solvents by fermentation. 1939 Distillers Co, being a supplier of raw materials for plastics and having conducted research in plastics, negotiated a 50% interest in B. X. Plastics. 1941 Acquired shareholding of 48% in F. A. Hughes and Co Ltd.
1944 Sold Gyproc Products Ltd to British Plaster Board Ltd in exchange for shares in that company. WWII: The company was able to produce less than one year's normal output of whisky during the whole war. Fortunately it was able to draw on stocks to maintain limited sales. Production of various chemicals was a major contribution to the war effort and the largest penicillin plant was under construction at the end of the war. 1945 Purchased outstanding 52% of F. A. Hughes and Co Ltd involved in plastics and moulding. 1947 Investment by Distillers in the works of British Industrial Solvents at Salt End, Hull to increase production of solvents, plasticisers, acetic acid, etc. Reorganisation and centralisation of plastics production at Barry. 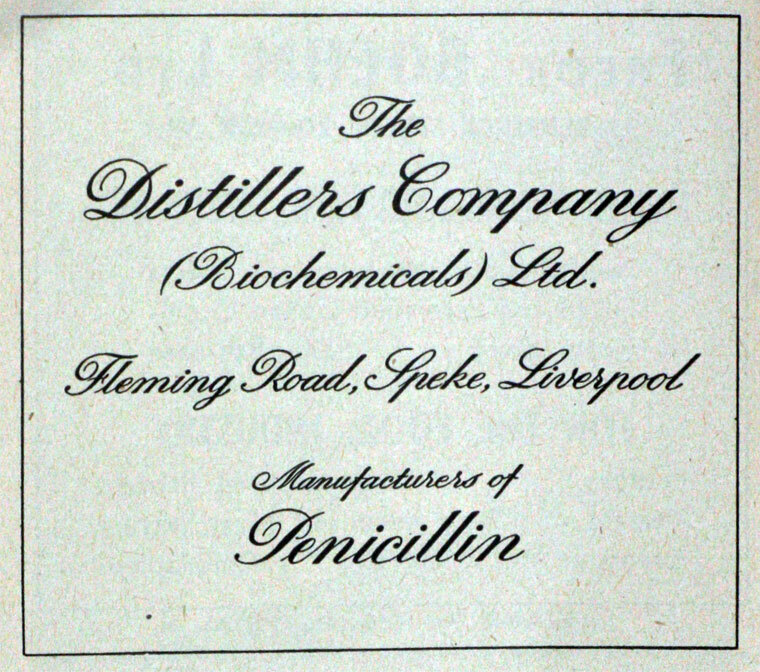 Purchase of the penicillin factory at Speke that the company had been operating for the government. Plans to develop large petrochemical plant at Grangemouth in conjunction with Anglo Iranian Oil, adjacent to the latter company's refinery. New plant would be built by British Geon Ltd to make PVC in association with the B. F. Goodrich Chemical Co; British Resin Products would also build new plant. 1950 Project at Grangemouth of British Petroleum Chemicals Ltd (joint venture with Anglo Iranian Oil) will produce synthetic ethanol which would alleviate the supply problems with molasses. Grangemouth would also be the location for a new plant to make styrene monomer by a new company, Forth Chemicals Ltd, which was owned two-thirds by Anglo Iranian Oil and one third by Monsanto Chemicals Ltd - this was part of a plan to make derivatives from the petrochemicals made by the main plant at Grangemouth. Acquired majority interest in Magnesium Elektron Ltd.
1951 Acquired the remainder of the shares in Magnesium Elektron Ltd from ICI. 1954 Distillers Co and Fisons would jointly acquire Murgatroyds Salt and Chemical Co. Ltd in order to safeguard their supplies of feedstocks important to their plastics businesses. 1954 In conjunction with the Oronite Chemical Co of California, Distillers Co formed Orobis Ltd to manufacture a range of Oronite's lub. oil additives in the UK. 1955 New plant to make vinyl acetate would be built at Salt End, Hull; it would be owned by a new company Hedon Chemicals Ltd jointly owned by Distillers Co and Shawinigan Chemicals of Montreal. Sales would be handled by Shawinigan and British Industrial Solvents. 1956 British Petroleum Chemicals Ltd was renamed British Hydrocarbon Chemicals with the partners in the venture, BP. 1958 Licenced UK rights to thalidomide. 1959 Wound up Commercial Solvents as the products of molasses fermentation were no longer competitive. 1961 Distillers Co bought the entire British Xylonite Group. 1962 Withdrew thalidomide from the market on news of adverse side effects. 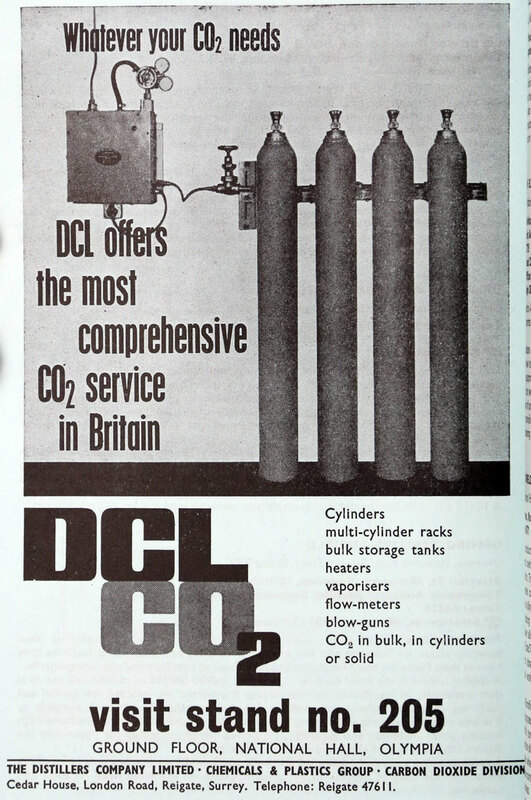 Distillers Co and Union Carbide agreed to transfer the majority holding in Bakelite into a jointly owned company (plus an offer to acquire the remaining shares), as well as Union Carbide's low density polyethylene activities at Grangemouth and the whole of British Xylonite Co . The new company would be called Bakelite Xylonite Ltd. This would include plants at Birmingham, Aycliffe and Grangemouth. Distillers sold its biochemical division to Eli Lilly of USA. Industrial group, principally in chemicals and plastics where there were 4 chemical divisions and 4 plastics companies as well as 2 service units; in the past year a 49% interest had been purchased in Synthite Ltd; others in this group included Bakelite Xylonite, Border Chemicals (a joint venture with BP and ICI), Murgatroyds Salt and Chemical Co. Ltd, Orobis Ltd., and British Hydrocarbon Chemicals Ltd (a joint venture with BP). 1964 New acetic acid plant would be built at Hull using a process developed by Distillers. The carbide plant at Kenfig would be closed. 1965 Purchased the share in Hedon Chemicals owned by Shawinigan Chemicals. Planned to construct vinyl actetate plant at Hull in conjunction with British Celanese. 1966 Border Chemicals would establish a plant, based on Distillers' process for manufacturing acrylate, at Wilton; Distillers also licensed the process to Union Carbide who would build a plant 6 times as large in USA. 1967 Distillers Co sold its chemicals and plastics business to BP because the division did not have the scale of its major competitors in USA. Negotiation about some of the JVs took months - by mid-year BP had acquired 5 of the joint ventures: National Chemical Products (of South Africa), Murgatroyd's Salt and Chemical Co. Ltd, Orobis Ltd., Synthite and British Hydrocarbon Chemicals Ltd. Union Carbide vetoed the sale of the 50% share in Bakelite Xylonite. 9 other joint ventures were the subject of ongoing negotiation. 1973 Distillers Co sold its 50% stake in Bakelite Xylonite to Union Carbide. 1986 It was acquired by Guinness. 1987 United Distillers was formed from combining the businesses of Distillers Co and Arthur Bell and Sons, both owned by Guinness. 1997 Became part of Diageo. This page was last edited on 12 August 2016, at 10:34.